edotco Group (“edotco”) today became the first towerco to utilise bamboo in the construction of a telecoms tower, which was installed on a rooftop in the Uttara region of Dhaka, Bangladesh. Developed in collaboration with Bangladesh University of Engineering (BUET) and deployed by edotco Bangladesh Co. Ltd., the noteworthy use of this renewable resource keeps in pace with the pulse of innovation which is in the DNA of edotco. This milestone also reinforced edotco’s foothold at the forefront of sustainable and green engineering. The research and development which was led by Professor Dr. Syed Ishtiaq Ahmad, Professor of Civil Engineering in BUET, focused on the design and viability of bamboo as an alternative material to traditional steel structures in telecommunications. Studies indicated that untreated bamboo has the ability to bear the weight of concrete while possessing the rigidity and tensile strength to support its own weight, making it a material for telecom structure. It can withstand gusts of up to 210km/h, with an expected lifespan of approx. 10 years with proper maintenance. A bamboo tower takes around 12 days to construct, and consumes less energy to manufacture compared to traditional steel towers. The structure has a capacity to house up to 8 antennas at a time, enabling co-location. As an added bonus, bamboo being inherently light, allows for easy transportation and installation of structures on rooftops without putting any additional stress on the building. The deployed structure underwent a chemical treatment as a measure to protect it from termite and mould attacks as well as adverse climate conditions. 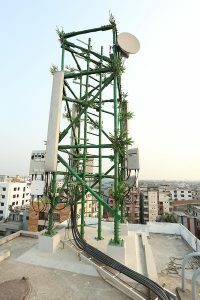 To ensure the successful deployment of the bamboo telecoms tower, edotco has trialed the unique solution at an experimental demo site in Kanchpur, Dhaka last December. our latest innovation which we conceptualised utilising natural, sustainable resources to build telecommunications infrastructure to lessen the impact on the environment. We are pleased that we have developed this solution in partnership with BUET, and hope we can continue to collaborate in other areas. It’s also testament to the quality of human capital in Bangladesh that we were able to pioneer this in Dhaka” said Suresh Sidhu, CEO of edotco Group. edotco intends to roll out more bamboo structures as proof of concepts (P.O.C) in several other areas in Dhaka in 2017; by 2018, edotco will take this solution to other markets where edotco operates and where bamboo resources are available. edotco Bangladesh was established in 2013 with the objective to provide telecommunications infrastructure services to customers, and in our bid to be the one stop center for telecommunication sites and bandwidth services in Bangladesh. With a footprint of over 8,200 sites nationwide, edotco Bangladesh is well placed with expertise to contribute towards carving the path to transform Dhaka into the Center of Innovation and Excellence, as part of the future towards Digital Bangladesh 2021.
edotco was recently awarded the Frost & Sullivan 2016 Southeast Asia Telecoms Tower Company of the Year Award for its demonstrated exemplary business growth and performance in Southeast Asia.